714 brides. 714 grooms. 714 I do’s. 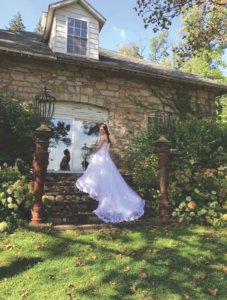 That’s the number of weddings that Frank and Barbara Pinto have hosted at their sprawling historic estate, The Peter Allen House just outside of Harrisburg. 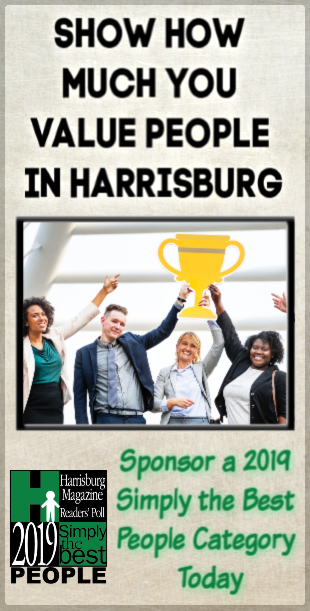 That would seem to make them the couple who have hosted the most weddings in the Harrisburg region, the un-official couple of love for Dauphin County. But it’s not just a business for this dynamic duo who will celebrate 39 years of wedded bliss themselves next month. Weddings have become a way of life, events they host at their home, not in a corporate building. The pair didn’t aspire to be wedding hosts, in fact it was pretty much the furthest thing from their minds when Frank, a South Philadelphia college professor moved to Harrisburg in the late 70s for what he thought would be a three-month stay at the State Senate. “Guess what?” exclaims Frank. “I never went home!” He brought Barbara up to Harrisburg and they were married soon after, which just happened to be two weeks before the Three Mile Island incident. Frank became President and CEO of the Community Bankers Trade Association, which is how the couple first set eyes on the Peter Allen House. But not as a wedding spot. 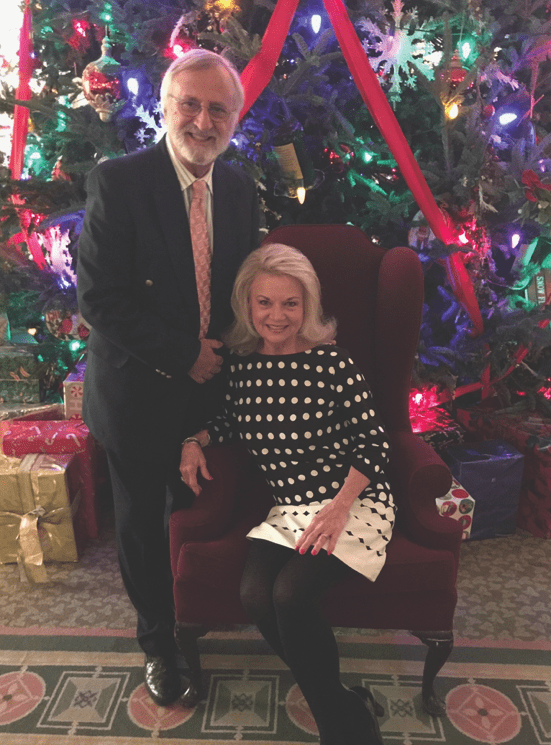 Part of Frank’s job involved throwing an Annual Legislative Reception during the holiday season, with Barbara as “the hostess with the mostess” according to Frank. They saw the grand Peter Allen House and immediately thought it would be the perfect setting for these parties. “Weddings were the furthest thing from our minds then,” laughs Frank. 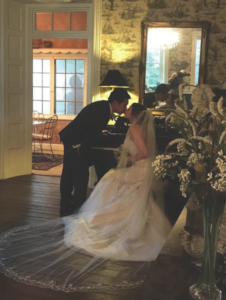 It wasn’t until one fateful day when one of the leaders in catering in the region asked to have her wedding at the estate did the focus turn from holiday party spot to wedding venue. And just like that, one of the area’s favorite wedding locations was born. Steeped in history, the property dates back to 1726 and is listed on both the National and State Historic Registries, making it the oldest home in Dauphin County. The picturesque grounds seem made for romantic scenes of couples in love, set against a backdrop of mountains, gazebos, terraces, Colonial stone and rolling meadows. But what’s even more uncanny is how well suited to the wedding business Barbara and Frank’s personalities seem to be. Although they may have landed in the industry by chance, their warm, familiar personalities (five minutes with them and you feel like their best friend) are a natural fit. “We’re geared to mesh with people,” said Frank. “We love people. I come from a big Italian South Philly family. I tell people, when you plan to have your wedding here, you become part of the Peter Allen Bridal Family. You’re going to be with us for 12 months, maybe 18 months depending on when they book. And we’re with them all along the way.” Frank prides himself on learning as much as possible about a couple and is still making the effort to remember each one of his 714 couples, many of who will still say hi to him when they see him around town. “Each wedding has its own uniqueness,” said Barbara, adding that they have couples come back regularly to visit for their anniversary and other events. “We have couples get married here and come back and have their baby showers here. We have couples come back and stay in our honeymoon cottage for their first anniversary. 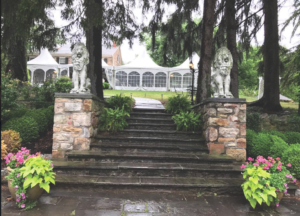 One couple had five children and they just wanted to return and show their kids where mommy and daddy got married.” Frank and Barbara even welcome couples back for picnics on the sprawling manicured grounds. And speaking of those grounds. Come spring they’ll be bursting with the colors of over 300 varieties of annuals, perennials and shrubs, plus honey bees, birds and butterflies — all thanks to Barbara’s green thumb. “She’s a Master Gardener, she knows her plants inside and out,” boasts Frank. And through her efforts the Peter Allen House has become a Certified Wildlife and Pollinator Habitat. “I’m a kid from South Philly, I still don’t know how to dig the holes deep enough. We complement each other. She’s the style and the class, I’m the ‘designated dancer,’” Frank adds with another laugh. (As anyone who has attended a party with Frank knows, this is a very accurate label). There are a lot of laughs between the couple, who exude that natural intangible chemistry that makes you feel good by just soaking it in as a mere observer. Their advice for couples planning a wedding: find the right location. Every bride and groom has a vision and every bride and groom also has a budget. “What you have to do is match that vision to the budget and have your elegance without breaking the bank,” advised Frank. The couple both said they marvel at the creativity and resourcefulness of the families they host. “Weddings can be expensive,” added Frank. “One lady spent $30,000 on flowers. 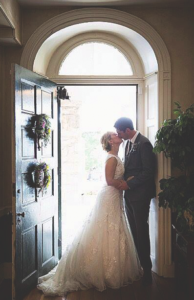 That excess and waste motivated us to begin working with Hospice of Central Pennsylvania, giving our brides the chance to donate their remaining flowers so small bouquets could be made for the hospice patients.” The couple has worked to make similar food contributions to local missions and shelters after weddings. “The event isn’t over that night then, someone else benefits. It’s been a thrill for us,” added Frank. It’s little things like this that make the venue unique. One can’t help but wonder what their secret is to such a enduring romance. “We laugh everyday,” beams Frank, “we smile everyday, we joke everyday and sometimes we cry. I wear my heart on my sleeve. We’ve had nothing but fun. It’s a labor of love.” “We are caretakers of this historic home and hope that someday another couple will fall in love with it as we have,” added Barbara.